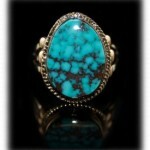 Blue Turquoise is what people think of first when they think of Turquoise. Historically, it is believed that Blue Turquoise was first found as ancient records indicated natives claimed it to be a “Sky Stone” and put on earth from the great ones above. Notable deposits of Blue Turquoise have been found in Egypt, Persia (Iran), China and the Southwestern regions of North America. 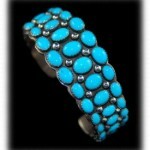 Most of the Blue Turquoise produced in the United States comes from Arizona. Notable Arizona Turquoise Mines that produce Blue Turquoise are the Kingman Turquoise Mine, the Sleeping Beauty Turquoise Mine, the Morenci Turquoise Mine and the Bisbee Mine. The Bisbee Mine closed around 1976 and mining for Morenci Turquoise ended around 1985. The Sleeping Beauty Turquoise Mine is still producing beautiful sky blue Turquoise and the Kingman Turquoise Mine is the largest producing Turquoise Mine in America. 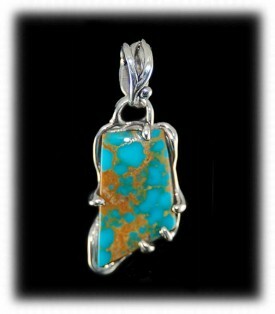 The Kingman Turquoise Mines is also the largest producer of high quality blue Turquoise in the world. Kingman Turquoise Pendant – This beautiful Turquoise Pendant features a Blue Turquoise gemstone from the Kingman Turquoise Mine located near Kingman, Arizona USA. 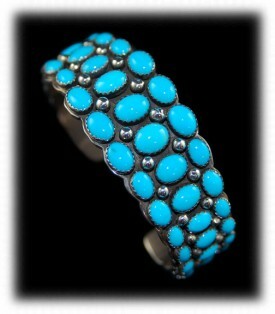 This variation of Kingman Turquoise comes from the Turquoise Mountain region of the mine. Turquoise Mountain has beautiful blue Turquoise with shades of blue-green with golden brown matrix and often spiderweb matrix. To the right is a beautiful Blue Turquoise Rings with Turquoise from the Morenci Turquoise Mine which is located in Morenci Arizona. The Morenci Mine is a Copper Mine and Turquoise is just one of the fabulous minerals that comes out of this mine. Most all of Morenci Turquoise is blue and this mine produced some of the most beautiful blue Turquoise that was ever mined in Arizona. The Silver looking matrix in this stone is iron pyrite which is commonly found in Morenci Turquoise. The mine stopped producing Turquoise in the early 1980’s. The Sleeping Beauty Turquoise Mine produced some of the finest clear sky blue Turquoise in the world. 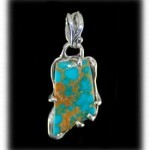 The mine is located in Arizona and has been heaven-sent for the American Turquoise Jewelry industry as the Blue Turquoise it produces is exceptional. Sleeping Beauty Turquoise is highly sought after worldwide, it is still in production today and we hope it continues to produce this fine quality blue Turquoise long into the future! 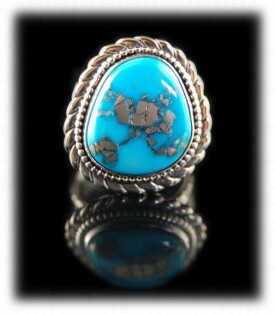 Bisbee Blue Turquoise is believed by most to be the finest Turquoise that ever came out of the ground in the USA. It come from the Bisbee Mine in Bisbee, Arizona and has been out of production since the late 1970’s. 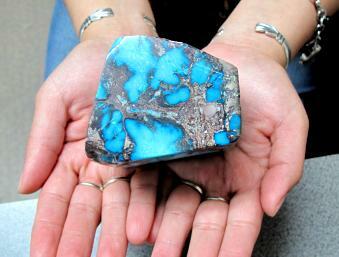 The Bisbee Mine produced some of the deepest blue Turquoise in the world for many years. It can be detected by its beautiful chocolate-brown to red matrix that runs in the Turquoise. 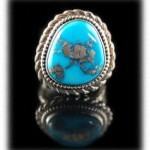 Bisbee Blue Turquoise is also found with spiderweb matrix which is some of the most valuable Turquoise in the world. Many spiritual leaders and healers believe Bisbee Turquoise holds the highest amount of metaphysical powers due to the minerals that the Turquoise runs with in the Mine. 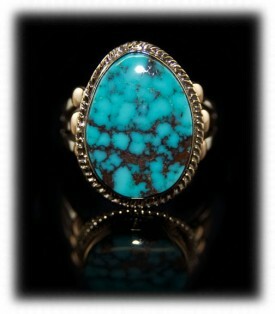 Bisbee Turquoise is now very rare, highly collectible and dear to the avid Turquoise collector.